In 19th century Montreal, socially, religiously, economically, culturally and politically, early immigrants in a minority situation in Quebec depended on themselves to survive and needed all the support they could get, and this meant that the various societies and benefit societies and political organizations that sprung up to support the new comers were critical in giving voice to their concerns and needs. The fear of death was faced almost daily as support and medical services were limited. Families were all important but, so often, poor and without means to adequately deal with health programs and old age. Education was limited to only the richer few. Churches were extremely important to all inhabitants, catholic and protestant alike. The Irish Protestant Benevolent Society (IPBS) came into being in 1856 following the reorganization of St. Patrick's Society which, up to then, had been run on non-sectarian lines from its founding in 1834. The status of St. Patrick's Society in Montreal become exclusively Catholic in 1856. As a result the Protestant members decided to form a society of their own. The parting of the ways between the two groups was effected in friendly sprit and understanding. Whatever the circumstances, the good relations that have existed for a long time continue to this day. ​In 1865 a charter incorporating the Society was granted by the Legislative Council and Assembly of Canada. It is interesting to note that this event pre-dates Canadian Confederation. The names of the original incorporators are worthy of record, many of whom have contributed in no small measure to the social and commercial progress of Montreal in particular and Canada at large. 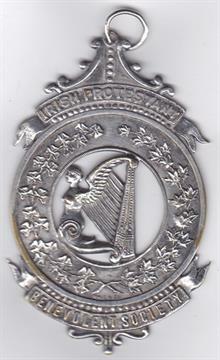 "The objects of the Society shall be charitable by nature; to advance the welfare of Irish Protestant in Canada; to afford advice, information and assistance; to afford pecuniary aid to Irish Protestants in Canada in need; or to assist in the education of such of their children as may require and merit such assistance, and to engage in such other charitable pursuits for the benefit of Irish Protestants in Canada, as may be deemed advisable." In the early days of the Society it was one of the President's duties to personally canvass the members and other Protestants of the community for donations to enable it to carry out its welfare work. This method was discontinued, and today the Society's chief source of income is from investments from the proceeds of gifts and bequest left by former members. At no time in its 150 years has the Society made any appeal to public or government sources for funds. During the famine which was rampant in Ireland in 1880 a sum of money was forwarded to Dublin Castle for the relief of the unfortunate sufferers, and in 1886 the Society joined the other charitable organizations in rendering assistance to the victims of the flood in Pointe St. Charles. On the 9th of December 1905 a home was purchased on Belmont Park from part of a bequest of Mr. William Warren who had been Honorary President of the Society at the time of his death early in the same year. This home was used by the Society as its headquarters until 1930 when the property was taken over by the Canadian National Railways for the new Central Station. The present location is on Sherbrooke Sreet in Westmount. In recent years, the Society established the Mathew Hamilton Gault Fellowship to assist students in the Irish Studies program at Concordia University under the auspices of the Canadian Irish Studies Foundation. This fellowship was funded by the membership, honorary president Leslie H. Gault, a number of foundations and The Sun Life assurance Company of Canada. The Society continues its benevolent mandate by providing monthly monetary supplements to a number of senior citizens in need, bursaries to deserving students, and grants to a number of Montreal charities including for example, The Old Brewery Mission. As well, it has been committed to the preservation of Grosse Ile, Quebec, a National Historic Site and its significance to Irish Protestants and the Canadian experience. Despite the formation of welfare agencies, old age pensions, family allowances, etcetera, the need remains and the demands on the Society continue. It is with a spirit of renewal, pride and faith that we enter the second half of our second century, perhaps stubbornly determined to carry on the work of The Irish Protestant Benevolent Society in rendering aid and assistance to its less fortunate countrymen, the elderly and those in need. All in the traditional way, with little publicity and display as possible. The Mathew Hamilton Gault Scholarship, The Canadian Irish Studies Foundation, Concordia University, to celebrate and promote the development of Irish Studies in Montreal. The IPBS 150th Anniversary Scholarship, The Canadian Irish Studies Foundation, Concordia University, to support a worthy student studying Irish studies at Concordia Univeristy. Irish Protestant Benevolent Society Scholarship, School of Canadian Irish Studies to support students studying Irish heritage. Restoration of the Protestant Chapel at Grosse Isle - capital contribution. The McCord Museum Irish Exhibit - capital contribution. The IPBS Annual Lectures at the School of Canadian Irish Studies, Concordia University. The Irish Protestant Society Annual Book Prize, McGill University. ​The Hospital Projects - a contribution to the New Shriners Hospital for Children (adjacent to The Montreal Children's Hospital of the McGill University Heath Centre). 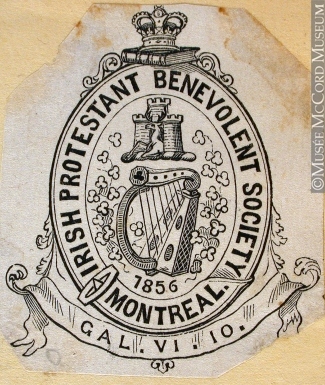 The Irish Protestant Benevolent Society held its first Meeting in the Mechanics' Institute, Montreal on April 8, 1856. The site of the institute became 360 St. James Street West, the former Head Office of The Royal Bank of Canada. 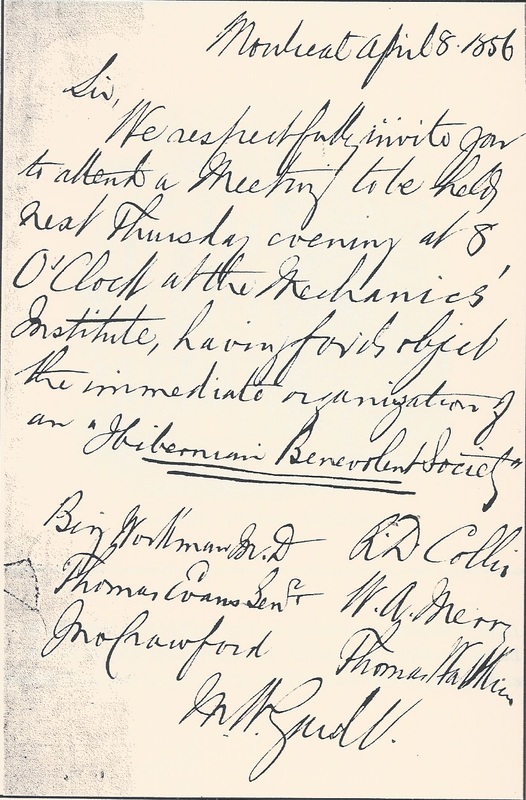 At first, the assembled men agreed upon the name "Hibernian Benevolent Society," but as there was a Hibernian Society already in the city, the word Protestant was added to create a distinction, and so a Protestant emigrant landing in Montreal would know which Society to apply to*. *Source: Dynamics of Ethnic Associational Culture in a Nineteenth-Century City: Saint Patrick's Society of Montreal, 1834-56. 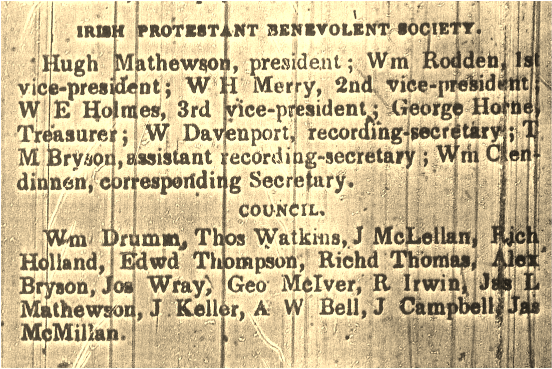 The Irish Protestant Benevolent Society was formed on April 8, 1856 and its first president was Benjamin Workman and the second was Hugh Mathewson. One of most important figures and a founder in the society's beginnings was Mathew Hamilton Gault who become an influential business leader in Montreal and the country. Almost all the members in the early years were not only Irish by decent, but Irish-born. First printed notice of the IPBS Officers and Council. Lovell City Directory of 1857. Canada as the "land of second chances"
"For many emigrants, Canada was both a gateway and a land of possibilities and second chances." "Canada is in truth a land of hope, which will not be disappointed where work of every kind wins well-deserved rewards." 1948 Lt. Col. E. Buchanan, K.C.